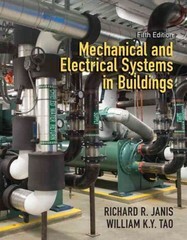 Mechanical and Electrical Systems in Buildings 5 Edition This extensively updated text and reference illuminates the modern realities of planning and constructing buildings with efficient, sustainable mechanical and electrical systems. Throughout, the authors place mechanical and electrical systems design in the overall context of the built environment. They extensively address engineers’ teamwork with architects, owners, and facility managers to provide high-quality, productive environments which reflect both environmental and cost concerns. Focusing on the “what,” “why,” and “how” of ME systems, they incorporate new developments in all major disciplines, including electrical, lighting, telecom, plumbing and HVAC. New coverage in this edition includes: HVAC design using VRF and chilled beam technologies; energy reclaim systems; dedicated outside air systems; assessment of solar thermal system efficiency; new fuel cell technology; updates on the economics of cogeneration, and much more.